Will Vitamin B12 Boost My Energy? Vitamin B-12, along with the seven other members of the B vitamin complex, aids the body with its metabolic functions, thus earning it the reputation as a vitamin that can provide energy. A micronutrient, vitamin B-12 is only needed in small amounts in the body, and on its own, it is not guaranteed to be an effective energy booster. Vitamin B-12 is commonly found in animal sources, such as eggs, milk and milk products, shellfish and poultry. For those who abstain from eating meat, consider taking a vitamin B-12 supplement to ensure you receive sufficient amounts in your daily diet. Along with producing new red blood cells, vitamin B-12 helps with regulating nerve transmissions and synthesizing DNA. Lesser functions in the body include helping to create hormones, lipids to help build cell membrane structures and protein. In some cases, vitamin B-12 can be used as an energy source for metabolic functions. Vitamin B-12 is essential to energy production in the body, but there is no documented proof that it alone provides a quick-fix energy boost, like a shot of caffeine. Vitamin B-12 can, in some cases, reduce feelings of tiredness and weakness associated with megaloblastic anemia. This type of anemia occurs when there is insufficient oxygen being brought to cells to produce energy for the body, leading to poor DNA synthesis in red blood cell production and a consequent decrease of hemoglobin levels in the blood. 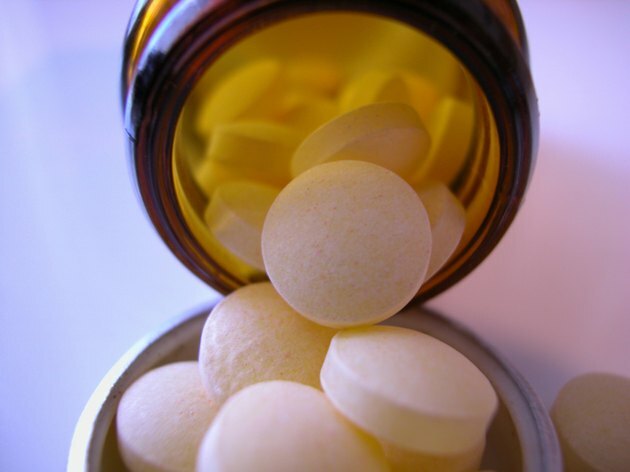 Megaloblastic anemia can occur when there is not enough vitamin B-12 or folic acid in the body. A daily dose of 2.4 micrograms of vitamin B-12 is sufficient for healthy male and female adults. This level of intake means that you should have sufficient levels of vitamin B-12 in your system to help sustain healthy metabolic function, reducing the likelihood of fatigue or weakness as a result of a poor metabolism. But low energy levels can be a result of a number of factors, and having healthy vitamin B-12 levels in your body will not guarantee more energy. If you suffer regularly from fatigue and low energy, speak with a medical professional as this may be a symptom of a larger health concern. Taking extra vitamin B-12 as a possible energy source is redundant because it is a water-soluble vitamin. This means that excess amounts of vitamin B-12 -- anything your body does not need -- will be excreted out of the system. Vitamin B-12, like all vitamins, are not individual cure-alls for ailments. Vitamins do not have a direct function in the body, and so they should not be considered as immediate energy sources. Rather, vitamins work by binding to enzymes to help with chemical reactions in the body, and so any association with energy production is not a direct correlation.